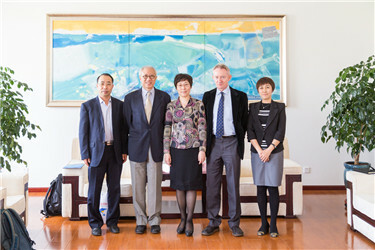 On May 26, President Liu Hong met with the delegation headed by Dr. Arthur Mcneill and Dr.Tang Shitao from The Hong Kong University of Science and Technology. 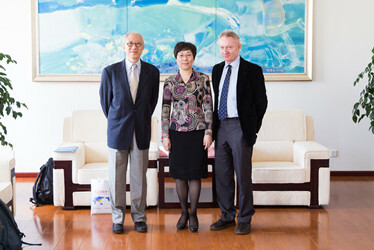 Upon their arrival, President Liu extended a warm welcome and sincere gratitude for their support of Teachers and Students Exchange Plan between Hong Kong and the mainland launched by Ministry of Education. During the meeting, they conducted in-depth discussions on the Exchange Plan and Exchange Project between the two institutions as well as academic and research collaboration. Dr. Arthur Mcneill expressed their heartfelt gratitude for the gracious reception. 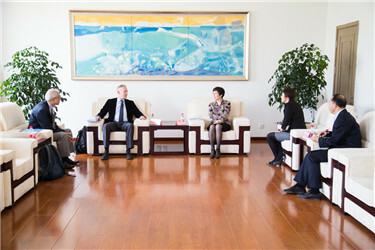 He said that thanks to the compound specialty’s curriculum, international campus environment and various Chinese cultural experience courses at DUFL, Hong Kong students have a better understanding of mainland history and cultures. 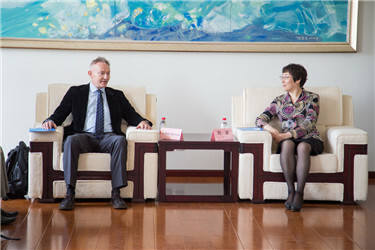 During the visit, Dr. Arthur Mcneill and Dr.Tang Shitao also gave lectures respectively for English majors, in which nearly one hundred teachers and students attended.